FFS President and Football Federation Samoa staff to showcase a medical emergency bag from FIFA to backup emergency calls during a match. FIFA funded the medical bags for all Member Association including the Football Federation Samoa. The most critical item in the bag is the automated external defibrillator or AED. It can immediately diagnose suspected heart problems. Defibrillator can be initiated on the field for a player that has a weak heartbeat. In May 2012, President of the Football Federation Samoa executive committee and CEO together with Dr Satupa’itea Viali Lameko attended the FIFA Medical conference in Budapest where the issue of sudden cardiac arrest on football field discussed. Leading up to the conference, five incidences of sudden cardiac death on football pitch. It was pointed out to all the participants of the conference that the presentation of these deaths is possible with the right medical care, equipment and trained panel. President Savae Togia Toetu Petana stated: football players health and well being is a top priority for FFS. We want to do everything we can look to after our players and officials on and off the field. We engage the Red Gross to be present at all our tournaments, since we now have an Emergency Bag we have the ability to prevent and sudden cardiac heaths in our country. The machine will be on the sidelines of all matches played at the FFS Complex in Tuanaimato. 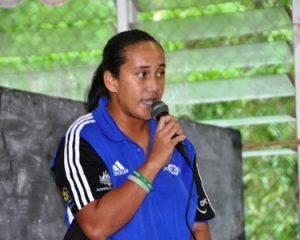 All sports in Samoa are welcome to use the machine if it’s needed.